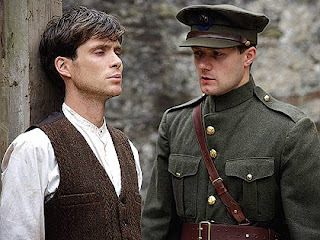 Ken Loach’s controversial, Palme d’Or-winning study of Republicans v the Brits in 1920s Ireland raised the hackles of several well-known UK critics (who, customarily, didn’t feel the need to actually see the film) as well as Irish commentators. It’s normally a sign that an artist has got something right when he angers both sides of a debate and claims of bias seem moot when a film comprises such lyrical beauty, steadfast portrayals and a marvellous, articulate script. For a British viewer, Loach’s film should leave an unpleasant taste in the mouth and a more-than nagging sense of shame at the atrocities committed by the British Empire in its most troublesome of ‘colonies’. Except it isn’t, obviously. Loach, collaborating seamlessly with his scriptwriter Paul Laverty and cinematographer Barry Ackroyd, has at once captured the beauty of Ireland without resort to chocolate-box imagery, the articulate rage of the oppressed Republicans without need of obvious tub-thumping and the tragic horror of the attendant violence in the growth of the armed IRA campaign. Cillian Murphy plays Damien, a young medical graduate bound for a career as a doctor in London who is urged, following the brutal killing of a 17-year-old in front of his mother by thuggish British soldiers, to stay and help the cause. At first unwilling, even mocking of his peers (”What are we going to do? Fight the British with our hurling sticks?”), his viewpoint and life are changed forever when he witnesses the violence of Ireland’s unwelcome guests at the train station from where he is about to leave. Murphy and Delaeney carry the movie, with brilliant support from Liam Cunningham as the older and wiser Dan and Siobhan McSweeney as Damien’s tragic lover, Julia. In fact, there is rarely a mis-step from any of the cast and it is remarkable the extent to which the film informs the viewer of the political turmoil at the heart of the struggle – achieved largely through very long sequences in which the characters do little other than express, passionately, their respective stances. In lesser hands, these sequences would have been dirge-like, but Loach and Laverty make them riveting. Loach’s characteristic wry comedy, such as the opening game of hurling, a teenage message-boy who loses his message concerning a truce (”I was told there was a ‘T’ word that was the most important”) and a melodramatic pianist who accompanies the silent newsreel that announces the momentous news of the creation of the Free State provide welcome relief from the grim reality on display, but there is only ever one way this can end. Shame, perhaps, on us all.